The incumbent governor of the Vladimir region, Svetlana Orlova, lost a runoff to Vladimir Sipyagin of the nationalist Liberal Democratic Party (LDPR). Two challengers have defeated pro-Kremlin candidates in gubernatorial runoffs, amid widespread anger over pension reforms backed by the ruling United Russia party and President Vladimir Putin. In the Far Eastern Khabarovsk region in the September 23 vote, the election commission declared Sergei Furgal, a federal lawmaker from the nationalist Liberal Democratic Party (LDPR), the winner over Governor Vyacheslav Shport of the United Russia party. The election commission said that Furgal had 69.6 percent of the vote to 28 percent for Shport. Turnout was listed at 42 percent. Meanwhile, in the Vladimir region, the election commission said that Vladimir Sipyagin of the LDPR had won the regional runoff with 57 percent of the vote, ahead of incumbent Governor Svetlana Orlova of United Russia, who had 37.5 percent. Turnout was listed at 38.3 percent, up from 33 percent in the first round of voting on September 9. The votes in the Khabarovsk and Vladimir regions were among four gubernatorial runoffs being held after incumbents or acting governors from United Russia failed to secure first-round victories in September 9 elections. In another runoff, held on September 16, the Kremlin-backed candidate in the Far Eastern Primorye region surged ahead at the end of the ballot count thanks to what election observers and opposition forces call a brazenly illegal effort to manipulate the results in favor of acting Governor Andrei Tarasenko of United Russia. The results of that ballot between Tarasenko, who met with Putin shortly before the vote, and Communist Party candidate Andrei Ishchenko have now been invalidated, with election officials citing "serious violations." 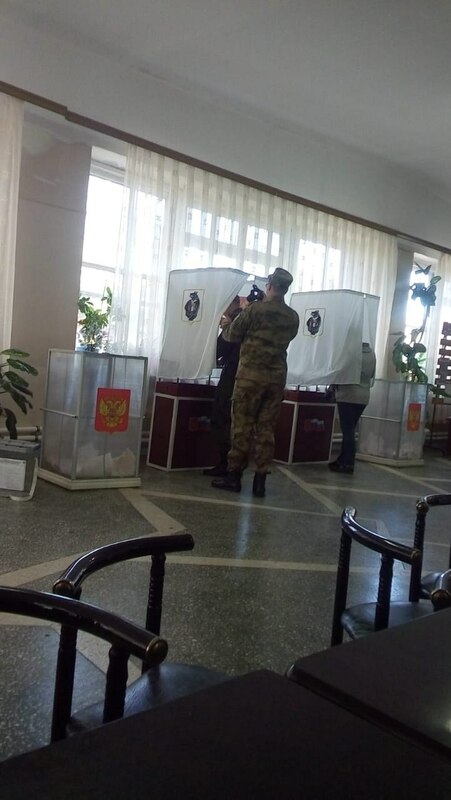 In the September 23 vote in Khabarovsk, the election teams of both candidates reported voting irregularities. Furgal's team reportedly filed 10 complaints. One of them is related to an incident at a polling station where a man in a military uniform was photographed while filming inside a booth while a voter was inside. Shport's supporters accused Furgal of illegal campaigning and of bribing voters. Khabarovsk Governor Vyacheslav Shport of United Russia was defeated by a challenger from the nationalist Liberal Democratic Party, Sergei Furgal. But Shport on September 24 conceded defeat, telling reporters, "The competition was tough. You have expressed your opinion and I accept your choice," according to the TASS news agency. He also wished "success" to the newly elected governor. Furgal edged out incumbent Shport in the first round but did not secure enough votes for an outright win. In the Vladimir region, Orlova, the United Russia incumbent governor, beat Sipyagin by 5 points in the first round with 36.4 percent but did not receive enough to avoid the runoff. Orlova appeared to offer voters some introspection in a video she released days before the September 23 runoff. "It seems like I tried -- and the results weren’t bad. So why wasn’t I able to reach many of you? You know how I answer that to myself? It means I did something wrong. I miscalculated somewhere," Orlova said. Another gubernatorial runoff had been scheduled the same day in the Siberian region of Khakasia. But incumbent Governor Viktor Zimin, who was appointed acting regional head by Putin in 2013 and won election later that same year, quit the race on September 21, citing poor health. Zimin, the United Russia candidate, had finished well behind Communist candidate Valentin Konovalov in the first round of voting on September 9, trailing his challenger by more than 12 points. The regional election commission in Khakasia on September 22 announced that the runoff would now be held on October 7. Kremlin critics consider both the LDPR and the Communist Party pliant tools in Putin's ruling system, and they back Putin's initiatives with some frequency -- particularly on foreign policy. But the rivalry on the regional level is very real and any LDPR or Communist victory is embarrassing for Putin and United Russia, which dominates politics nationwide. The elections come amid widespread discontent with a Kremlin-backed plan to raise the retirement age that triggered waves of street protests and has dented Putin's approval ratings after its unveiling earlier this year.